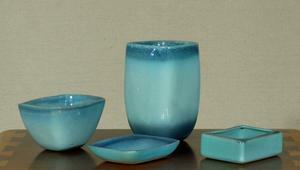 Nice group of four mid-century modern ceramic pieces by Glidden, consisting of a vase, bowl, plate, and box. Vase is 8.5 inches tall x 5 inches wide. Glidden Pottery is a unique stoneware bodied dinnerware and artware that was produced in Alfred, New York from 1940 to 1957. We have a group of four items from the Matrix series, which we believe was produced in 1955. This group is a beautiful and rich torquoise blue green, with darker tops and bases.